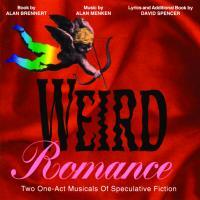 Weird Romance, which debuted in 1992 at the WPA Theater, is actually two one-act musicals under a main title. The Girl Who Was Plugged In and Her Pilgrim Soul are both science fiction stories that deal with love, reincarnation, and memory. The Girl Who Was Plugged In is about a homeless woman who is convinced by a company who “manufactures” celebrities to allow her mind to be transferred into a new, perfect body. She learns a new life and falls in love with the son of one of the executives. When she tries to confess that she is not what she seems, her soul is taken from the body and replaced with another. Her Pilgrim Soul focuses on a scientist who is developing full, three-dimensional holograms. One day, the hologram of a baby appears in his lab and begins to rapidly grow into a woman. The scientist becomes obsessed with the holographic woman and discovers himself while researching her. Alan Menken (best known for Little Shop of Horrors and various Disney hits) and David Spencer wrote the music and lyrics, with Alan Brennert as the book writer. Brennert adapted Her Pilgrim Soul from his own short story; The Girl is taken from another writer’s work. Ellen Greene, Jonathan Hadary, Sal Viviano, Danny Burstein, Jessica Molaskey, Valarie Pettiford, and Eric Riley make up the cast of both halves and are featured on the original cast album. The cast of Weird Romance is made up of strong voices who sing with emotion and bring out the best in the songs. (Ignore the opening number, “Weird Romance” and you’ll feel much better about the whole show. It’s jarring and doesn’t fit in with the rest of the score at all.) I enjoyed this album. It’s not as funny as Little Shop of Horrors or as jubilantly romantic as Beauty and the Beast, but it’s well-written with a few numbers that will pleasantly stay with you and have you humming the refrain.